(Nanowerk News) Waseda University researchers have developed a process to dramatically improve the quality of 3D printed resin products. The process combines greatly improved surface texture and higher structural rigidity with lower cost, less complexity, safer use of solvent chemicals and elimination of troublesome waste dust. Kensuke Takagishi and Professor Shinjiro Umezu, both of the Waseda University Faculty of Science and Engineering, Department of Modern Mechanical Engineering, chose the Fused Deposition Modeling (FDM) type 3D printer, whose relatively low cost makes it most suited for in-home use, and addressed the issue of surface "ribbing," rough appearance due to grooves between layers of applied resin material. This research is published in Nature's Scientific Reports ("Development of the Improving Process for the 3D Printed Structure"). One existing method for surface smoothing is polishing, or grinding down the high places to reduce the appearance of "ribs". However, the polishing devices add complexity and cost to the machine, and capture and disposal of the generated dust adds further complexity, making the whole machine impractical for household use. Another existing method for finishing uses vaporized solvents to melt and smooth the surface of the printed piece. 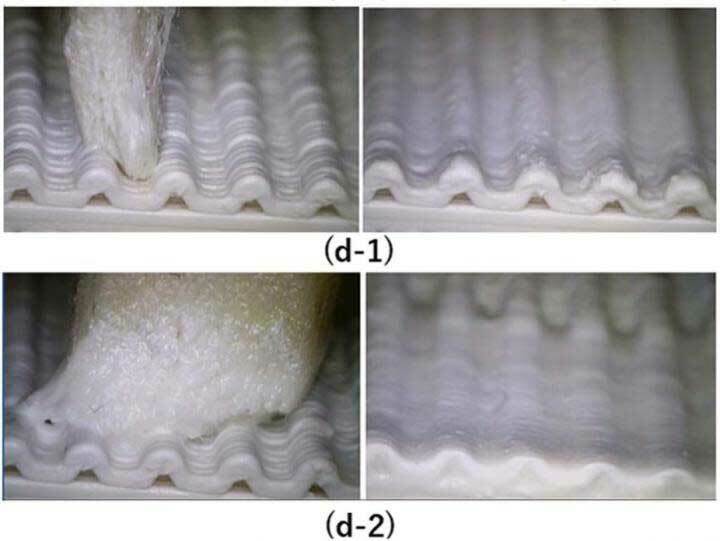 This method has the advantage of capturing some of the dissolved material in the bottom of the grooves, improving smoothness and structural integrity with less wasted resin; however complexity of the machine, indiscriminate dissolution of the entire surface, and handling of large amounts of flammable solvents are major issues. 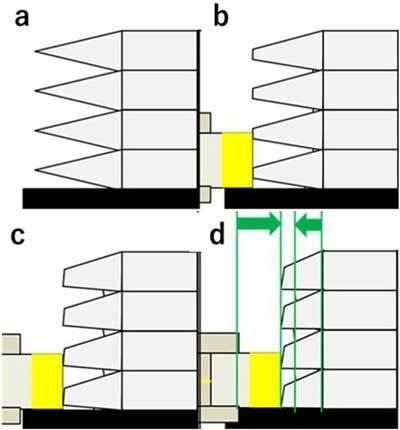 The Waseda researchers developed and tested a method called 3D Chemical Melting Finishing (3D-CMF), which uses a tool like a felt-tip pen to selectively apply solvent to certain parts of the printed piece which require smoothing. 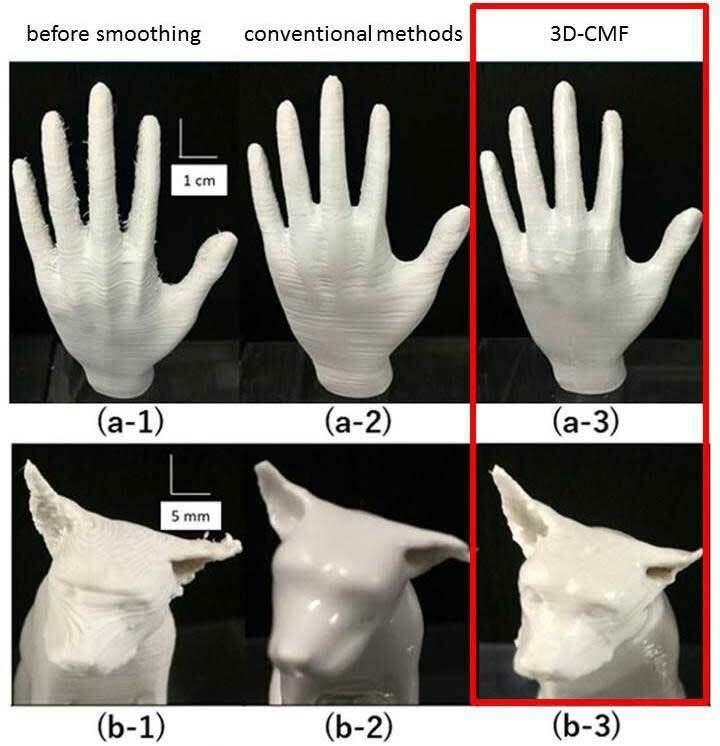 The new 3D-CMF method has major advantages over previous methods, which promise to move 3D printing into a much more attractive commercial position. 3D-CMF removes less material, creating less waste and achieving more precise shaping, and uses less solvent for better safety and lower cost. In addition, pen tips can be changed to further increase surface shaping precision.